What Exactly Happened at Queen and Spadina? A step-by-step explanation of why, exactly, your commute was all messed up for two weeks. The project's first step was excavation. Guys with jackhammers came and tore up the top layer of concrete. The old tracks also had to be dealt with. More concrete was removed with small excavators. Heavier equipment would have sped things up somewhat, but Kashani says the TTC was limited by the overhead streetcar wires. Any construction vehicles tall enough to disturb those wires would have been more trouble than they were worth. There were three layers of concrete at the intersection: surface, infill, and foundation. A challenging aspect of the job for Kashani and his workers was that all three layers were bonded together. They couldn't remove the top without also removing the foundation. The workers poured a new foundation layer. The new tracks arrived in prefabricated chunks. (Kashani calls them "blocks.") They were built off-site, at a TTC yard. Using these motorized trolleys, the workers lifted the rails into place. They welded the rails together. After the rails were installed, the workers poured a layer of concrete infill to lock everything into place. This time, rather than allow the infill to bond with the foundation, they poured the two layers separately. The separation between the two layers will make future track-replacement work at the intersection easier, because it will be possible to excavate without damaging the foundation. In two or three decades, when Kashani expects the TTC to replace the tracks again, it might not take quite so long. Workers poured a new surface layer of concrete. The TTC's fleet of new low-floor streetcars (the first of which are expected to show up in 2013) require some new grooves to be cut into the concrete around the tracks, so the workers added those. All this work didn't occur simultaneously across the entire intersection, by the way. At each step, workers finished the middle first, then completed each direction: east, west, south, and north. Also added during the track reconstruction were new electric switches. No longer will streetcar drivers need to adjust the tracks manually, with crowbars, whenever they need to make a turn. After the track work was complete, the workers began to repave the stretches of road they had dug up. Queen and Spadina's concrete crosswalks have been replaced with asphalt ones, because current municipal construction standards call for that. And here's a Queen streetcar running on the completed tracks, earlier today. Part of the intersection remained closed as of this afternoon. 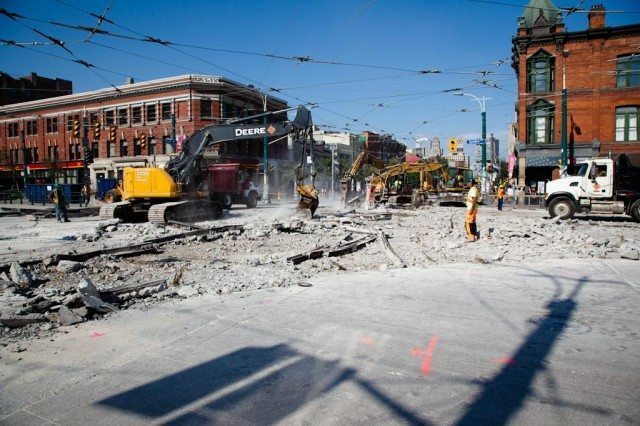 The intersection of Queen Street and Spadina Avenue reopened today after being closed for two weeks while TTC construction crews replaced the streetcar tracks there. As one of only three intersections in the city where streetcars need to turn in all eight possible directions (the other such intersections are King and Bathurst and King and Spadina), Queen and Spadina presented unusually complex engineering problems. Mohammad Kashani, a project engineer for the Spadina track-replacement effort, talked to us about the process of overhauling the intersection. For step-by-step details, check out the (mostly) chronological gallery of the work, above. All the information is in the captions.